Sporting KC has re-acquired Krisztian Nemeth, who previously played for the club in 2015. As Sporting Kansas City looks to make a playoff push, they’re bringing back an old friend and hoping that he’ll provide a needed boost. Sporting Kansas City announced Monday that the club has acquired forward Krisztian Nemeth from the New England Revolution in exchange for $250,000 in Targeted Allocation Money, $100,000 in General Allocation Money and a natural first-round pick in the 2020 MLS SuperDraft. Nemeth has been added to the Sporting KC roster and will occupy an international spot. The 29-year-old Nemeth returns to Sporting KC after recording 16 goals and seven assists in 33 competitive matches for the club in 2015. The forward joined Al-Gharafa SC in Qatar in 2016 and has spent the last 12 months in Major League Soccer with New England. After receiving zero caps in 2014, Nemeth revived his international career with the Hungary Men’s National Team during his time with Sporting KC. He played eight of his 34 career matches for the Magyars in 2015, scoring twice in UEFA Euro 2016 Qualifying and helping Hungary clinch its first European Championship appearance since 1972. Nemeth featured twice at UEFA Euro 2016 in France, starting in a 2-0 win over Austria and coming off the bench in a 3-3 draw against eventual champions Portugal. He went on to represent his country with three appearances in 2018 FIFA World Cup Qualifying and scored his fourth international goal in a 3-2 friendly defeat to Kazakhstan on March 23. In January 2016, Nemeth joined Al-Gharafa SC, where he scored 13 goals across 26 appearances. 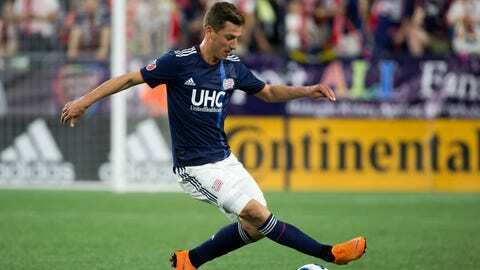 After one and a half seasons in the Qatar Stars League, Nemeth returned to MLS last August when he joined New England. He started seven of 21 league appearances for the Revolution, tallying a goal and three assists.